For those who may not know, tell us about your company Gentle Haven Massage. Gentle Haven Massage is a mobile massage company that was created in 2015, in Jackson, Mississippi while I was in massage therapy school. I am licensed in Texas and Mississippi. I am currently working on a few other states to be licensed in. A lot of people ask why the name Gentle Haven? I came up with the name that describes my clients’ experience while being serviced. Gentle Haven Massage is where my clients can create their own “haven for relaxation”. I was a track and field athlete majority of my life (age 9 thru age 20). I wanted a career that would allow me to be a part of sports and overall wellness. Every massage therapist is different in their own way. I cater to my client’s by allowing them to pick their own music that helps them relax best, and also provide their favorite snacks and non alcoholic beverages after their sessions. I also travel to the clients that do not want to leave their home. I know how hectic Dallas traffic can be, so I try to make it as easy as possible. I also believe everyone needs a touch of Gentle Haven Massage, so my rates are set up to fit anyone’s budget. I am a divorced mother of two and it is very challenging being an entrepreneur with no assistance. I just recently moved from Jackson, MS after losing my home and my business after 5 years of living there. I opened my location in North Dallas in October with donations from family and friends. I commute back and forth from Dallas to Louisiana to work and to see my babies. I overcome my pain points DAILY, by prayer, planning and perseverance. Knowing that I have two little humans that depend on their mother for everything, makes me go harder no matter the adversities that I am facing. Some weeks are really good and some are really bad, but I know that the outcome is always positive. I was #COSIGNed last year by Keara Stanley, Owner of @kmsglamstudio after just one massage service. That meant a lot to me and made me believe that people will really stand behind your brand. 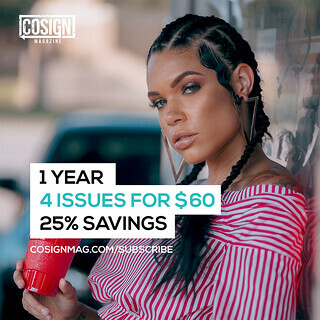 Another way a #COSIGN impacted my business was seeing my idol and mentor, Karen Civil on the cover of COSIGN Mag. Everything she stands for is AMAZING! I see my company being one of Dallas-Fort Worth’s Top Massage Therapy companies and also expanding while landing major contracts with professional sport teams and other major corporations.